Finish All in 1 Powerball Fresh, 94ct Tabs - Stock Up Deal! If you are brand loyal to Finish Dishwasher Detergent (like we are! ), this is for you!! Stock up on this HOT Finish Dishwasher Detergent Deal on Amazon! Hurry and get the Finish All in 1 Powerball Fresh, 94ct, Dishwasher Detergent Tablets today for as low as $11.21 from Amazon when you choose Subscribe & Save with at least 5 subscriptions and clip the coupon. That’s less than 12¢ per tab! If you prefer one-time purchase (to get it sooner), pay $13.36 after coupon. Amazon Prime members get FREE 2-day shipping! If you are not a Prime member, get FREE shipping when you purchase $25 or more of eligible items across any product category. Check out the Finish Dishwasher Detergent details below. From the World’s #1 Recommended Brand*, Finish All In 1 dishwasher detergent tablets give you an amazing clean and shine – which means you will never have to re-wash your dishes again. 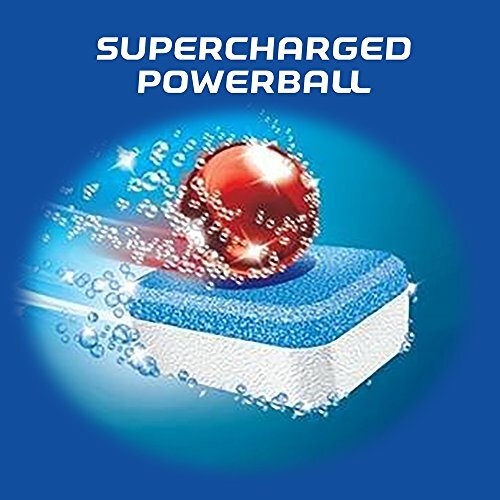 Our Powerball supercharges the tablet, bursting into action to scrub away the toughest food residues like dried-on food, such as lasagna and oatmeal. Our powerful cleaners remove even the toughest stains, like coffee & tea, and gently scrub your dishes & glasses sparkling clean. All In 1 tablets (individually wrapped and pre-measured) are safe for septic systems. Buy the Finish All in 1 Powerball Fresh, 94ct, Dishwasher Detergent Tablets from Amazon.